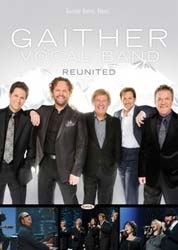 This live musical event celebrates the beginning of a new era for the Gaither Vocal Band, who recently reunited former members with current members to create an unprecedented all-star line-up of voices. Filmed before an enthusiastic live audience at the Majestic Theatre in San Antonio, Texas, this historic night of music is the first-ever DVD recording of the brand new Gaither Vocal Band, featuring: Bill Gaither, Michael English, Wes Hampton, Mark Lowry, David Phelps plus an incredible guest performance by The Isaacs. 1. Alpha And Omega This live musical event celebrates the beginning of a new era for the Gaither Vocal Band, who recently reunited former members with current members to create an unprecedented all-star line-up of voices. Filmed before an enthusiastic live audience at the Majestic Theatre in San Antonio, Texas, this historic night of music is the first-ever DVD recording of the brand new Gaither Vocal Band, featuring: Bill Gaither, Michael English, Wes Hampton, Mark Lowry, David Phelps plus an incredible guest performance by The Isaacs. 15. Mary, Did You Know?